For BMW Team RLL, when it rains it pours both literally and figuratively as it turns out, in Sunday’s Mobil 1 SportsCar Grand Prix. Auberlen started the race from second on the class grid but got past pole-sitter Dirk Werner’s No. 911 Porsche on the opening lap and quickly jumped out into the lead ahead of his teammate Martin Tomczyk in the No. 24 BMW. Auberlen held the lead throughout his 46-minute opening stint before turning the car over to Sims. The 29-year-old London native briefly trailed the pair of Corvette Racing entries, which were on a slightly different pit strategy, but eentually regained the lead. He had his hands full with changing weather conditions — the skies opened up two different times over the final hour of the race — as well as a charging Patrick Pilet in the No. 911 machine and his own teammate, John Edwards in the No. 24. He found his way past Edwards and back into the lead with 35 minutes remaining, and then kept Pilet at bay for the next 25 minutes before Pilet retired with a mechanical failure. Sims then managed to hold off Edwards in the race that finished under full-course caution. It was Auberlen’s 57th career victory in major North American sports car competition, moving him to within three of leader Scott Pruett on the all-time list. 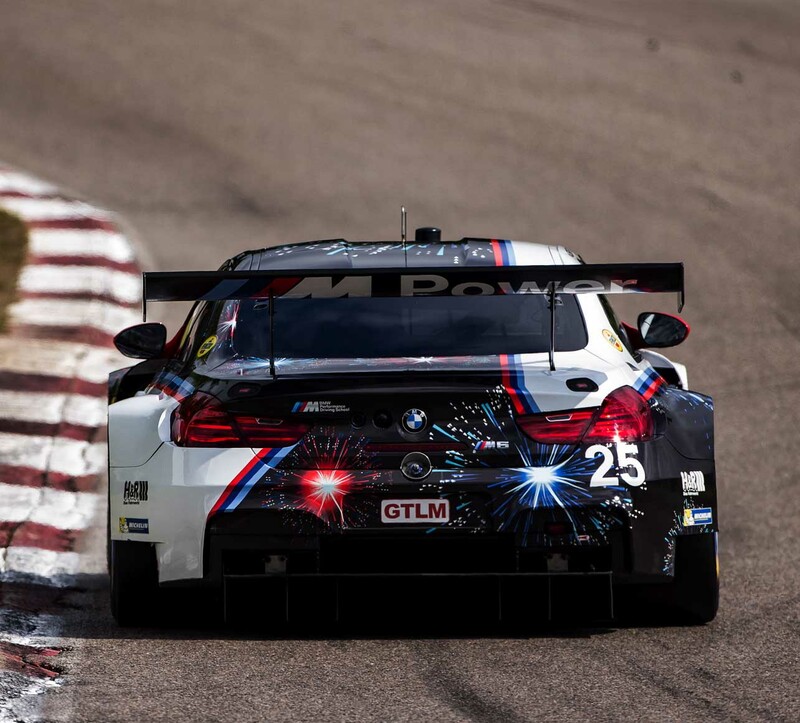 It was BMW’s first 1-2 sweep in GTLM since the 2015 WeatherTech Championship race at Mazda Raceway Laguna Seca and was the first sweep of the top-two spots for any GTLM team since the Porsche GT Team went 1-2 at Circuit of The Americas last September. Edwards and Tomczyk were second in GTLM and No. 67 Ford Chip Ganassi Racing Ford GT co-drivers Ryan Briscoe and Richard Westbrook rounded out the podium with a third-place run. Briscoe and Westbrook won the GTLM race last year at Canadian Tire Motorsport Park. A scary incident involving Jordan Taylor in the overall race-leading No. 10 Cadillac DPi and Tommy Milner in the No. 4 Corvette Racing Chevrolet Corvette C7.R in turn four brought out the second of the race’s three full-course cautions with slightly more than 20 minutes remaining. Milner crashed heavily into the tire barrier but was not injured. The GTLM class headlines the next WeatherTech Championship round, joining the GT Daytona class for a two-hour and 40-minute race at Lime Rock Park in Lakeville, Connecticut, on Saturday, July 22.